The products on this datasheet are no longer being sold by Tektronix. Tektronix leads the market in developing products for new and emerging audio, video, and cable technologies. This time in the field of MPEG-2 transport streams. The MTS100 is an innovative solution to the problem of testing equipment used in a MPEG-2 network. Perform creation, generation acquisition, and analysis of MPEG-2 transport streams quickly using the intuitive icon-driven user interface. The MTS100 can create, generate, acquire, and analyze MPEG-2 transport streams. From a transport stream as basic as a single program to a more complex transport stream with multiple programs and many elements in each program, the MTS100 can handle it. All applications are preloaded, making the MTS100 fully configured and ready to use immediately. Each of the six specific software applications performs their own function to aid in evaluating your system. The MTS100 gives you the ability to create transport streams with complete control over many of the various MPEG-2 parameters. A few examples are: placement of time stamps, timing offsets, data rates, PES packet size, jitter, channel coding, and DVB-SI information. An included CD-ROM contains several audio and video elementary streams. The video elementary streams contain both motion sequences and traditional television test patterns. Use these elementary streams for creating your own MPEG-2 transport streams. Analyze acquired transport streams using a simple graphical interface. The hierarchical view gives an outline of the transport stream's structure, while the interpreted view lets you examine syntax and the data values for each field in the packet headers. It will even allow you to examine the actual hex and binary values. It searches for errors in the transport stream, PES packet, and Table Headers, highlighting any it finds. The Analyzer application has easily accessible, clear explanations of the fields and parameters. 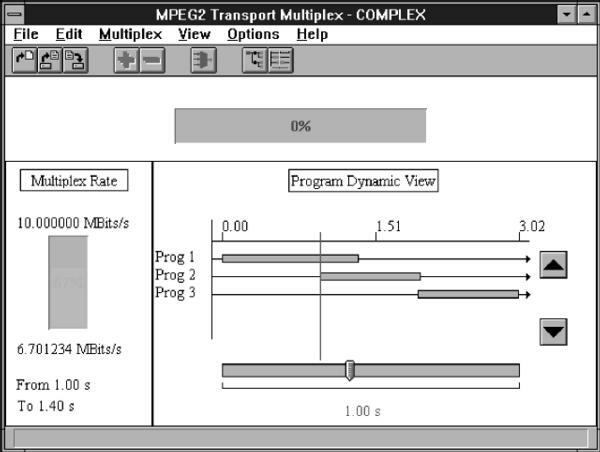 You could even use the Analyzer to train people on the composition of the MPEG-2 transport stream. Data rates from 1 Mbps to 45 Mbps are available. With the 8 GB of storage capacity, this allows a minimum of 20 minutes of acquisition or generation time (four files, 5 minutes in length at 45 Mbps). The acquisition or generation can be made nearly continuous by using the end-to-start looping feature. The MTS100 operates on a Windows NT™ platform. This makes interconnecting to any existing network relatively simple. This serial interface complies with the electrical characteristics of ITU-T rec. G703 (HDB3 code) for 8.448 and 34.368 Mbps. These are the only G703 frequencies available. The mechanical connectors are SMBs. The ECL Serial and ECL Parallel ports share the same 25-pin subminiature D connector. The parallel version provides eight balanced data pairs while the serial version provides one. Additionally, CLOCK, DATA_VALID, and header-sync (PSYNC) values are available. The voltages are at ECL levels. The maximum operating bit rate is 45 Mbps and the minimum is 1 Mbps. A control port is available to regulate the flow of data in this port. The control port is a subminiature 9-pin D connector, and adds flexibility to the ECL Parallel and Serial port by adding three control signals that provide two more operating modes. The TTL 50 ohm serial interface takes the form of a clock and data signal. The signals operate at TTL levels, with a maximum data rate of 45 Mbps. The connectors are male SMBs (one data and one clock). This port can be synchronized to an external clock using the Clock Port. This serial interface provides a differential signal at RS-422 levels. It provides both input and output ports. The mechanical connector is a 9-pin subminiature D connector. This input provides timing for the TTL 50 ohm and 10-Mb Serial ports. It expects inputs at TTL levels. The maximum operating frequency is 45 MHz. The mechanical connector is an SMB male. There is a tremendous amount of information in a transport stream. The Analyzer displays this information in a logical and convenient manner. Figure 1 gives the hierarchical tree display shown when first performing an analysis. From here, you can quickly see an overview of the transport stream. Figure 1. The Analyzer's hierarchical view. You can shift to a more detailed view, the interpreted view shown in Figure 2. This view gives the details of all Packet Headers, including PAT, PMT, NIT, PES, transport, and DVB-specific tables. Figure 2. The Analyzer's interpreted view. There are two parts to each parameter in this display: syntax and semantic. The syntax defines each field, while the semantic gives the current value (in decimal or hexadecimal). Obtain more information on either field by double-clicking on it. 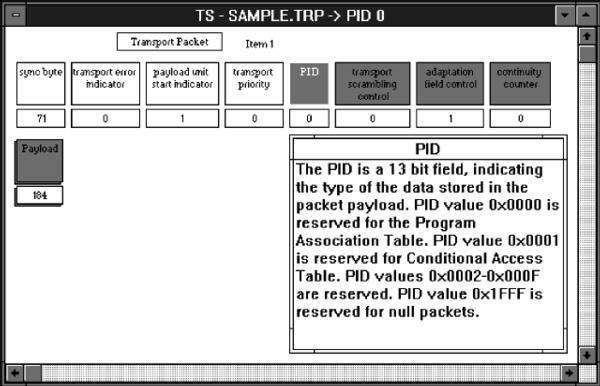 (Figure 2 shows the additional information available when the syntax portion of the PID is double-clicked.) If the syntax information is not required, a binary- or hex-dump view is also available. Scrolling through the packets is easy. Use the Next or Previous arrow button at the bottom of the application window. You can also specify a packet by the number. Each packet and table have a defined structure and the Analyzer allows you to view each of these to check structure and search for errors. Parameters in red, flag errors. The Analyzer performs error analysis. The application calculates the table CRCs and compares them to the CRC value in the table data. The semantic values are compared to the MPEG-2 transport stream standard. Any value in error is flagged in red. The Analyzer searches for errors in the interpreted view and automatically displays the first one it finds. An explanation of the error is available when the semantic value is double-clicked. A graphical display, as shown in Figure 3, is used to express the timing. All the relevant information about the PCR is available by double-clicking on the clock icon. You can also display the PCRs in a table format listing the parameters for all the PCRs in the selected display. Figure 3. The PCR display. 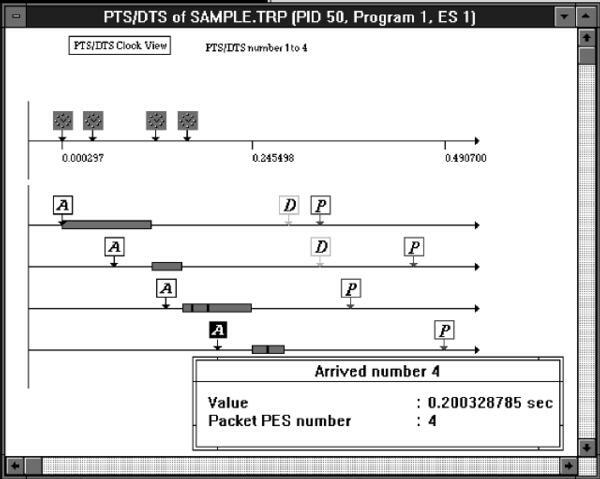 The placement of the PTS and DTS in the packet headers (Figure 4) has its own graphical interface. It gives the placement of the PTS, DTS, and access unit arrival times. The video access unit content type (I, P, or B frame) can be determined from this display. If you prefer, display the PTS/DTS in a table format listing the values of the parameters. Figure 4. The PTS/DTS display. Display the percentage of the multiplex rate each PID is using in a pie chart, using the Multiplex Allocation command. This feature is useful to view all PIDs in the system and how much time is being used by each one. Multiple windows are available in the Analyzer application. You can display the hierarchical view, interpreted views, and timing displays simultaneously. The Multiplexer application allows you to generate transport streams to rigorously test your own equipment. This guarantees a "good" signal as the starting point for any system test. The Multiplexer can create transport streams with up to 20 programs. Each program can have a maximum of 10 elementary streams, with a maximum of 5 of any one elementary stream type. 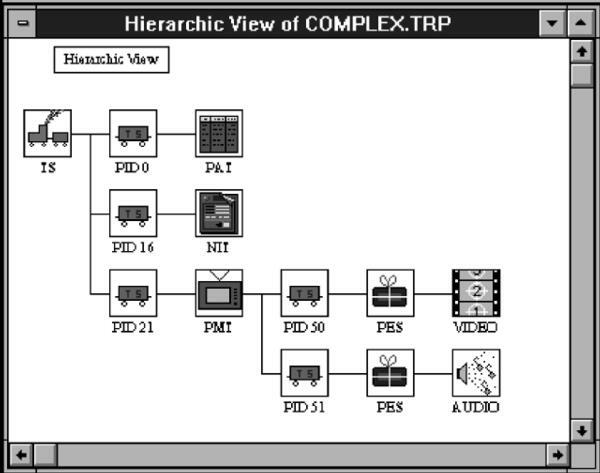 Figure 5 shows the hierarchic view of the Multiplexer. This view allows you to see the structure of the multiplex while you are creating it. Figure 5. The hierarchic display. Figure 6. The hierarchic display with DVB tables. As you fill the multiplex, the bar graph on the left keeps you abreast of the amount of data rate left in the multiplex. It displays the highest usage rate. The dynamic display (Figure 7) gives insight into the timing relationships between the programs in the multiplex. It allows you to see the start and stop times for each program and the data rate all programs contribute to the multiplex at a selected time. Figure 7. The dynamic display. The Multiplexer does not create the transport stream as you add and adjust the parameters, rather it makes a configuration file. This speeds up the application and allows you to create slight variations to the transport stream easily. Before creating the transport stream, the program checks for errors and allows you to correct any it finds. 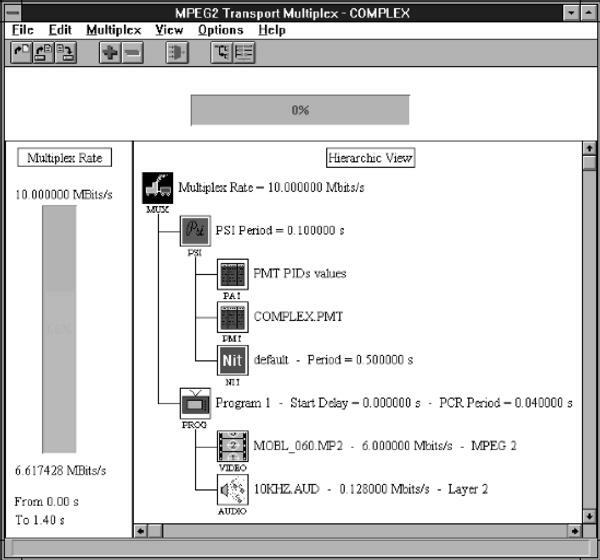 The Multiplexer generates the transport stream on either the system disk or the Data Store Disks. While it generates the transport stream, the Multiplexer gives information about the estimated final system clock time and the running time. The Multiplexer automatically calls the PSI and SI Table Editor application whenever required to edit the table parameters. DVB-specific (Digital Video Broadcasting) tables add information enabling DVB IRDs (Digital Video Broadcasting Integrated Receiver Decoders) to automatically tune to a particular service and allows grouping of services into categories with relevant schedule information. These tables provide the EPG (Electronic Program Guide) information. Data necessary for the DVB IRD to automatically configure itself is available in the NIT, SDT, BAT, and EIT tables. Figure 8. 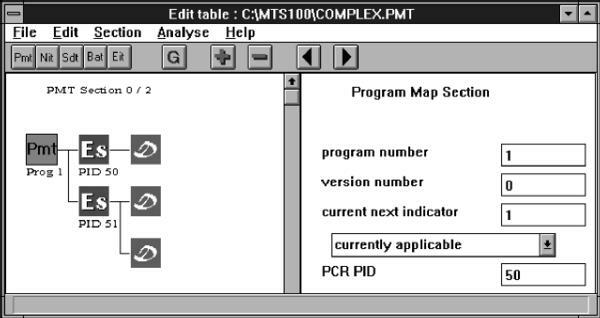 The PSI/SI Table Editor. The PSI and SI Table Editor allows the user to change the data in the SI and PSI tables to fit their requirements. Table 1 gives the parameter types available for each of the table types. Nearly all the parameters described in ETS 300 468 October 1995 are editable in this application. NIT contains the transport streams. Transport streams define transport stream ID. SDT must have the same transport stream ID. Services contain service descriptors and service IDs. EIT must have the same service ID and transport stream ID to be interrelated to the SDT and NIT. Figure 9. The global view showing the association between the tables. The PSI and SI Table Editor provides a coherence check of all open tables. It checks both the inter- and intra-table parameters for coherence to the standard. This application allows you to chain the coding or decoding together to meet the DVB coding requirements or break the chain to test your own coder or decoder. To aid in the design and evaluation of the decoder PLL, knowledge of the specific amount of jitter introduced into a system is mandatory. This jitter would represent the time variance of the transmission system. 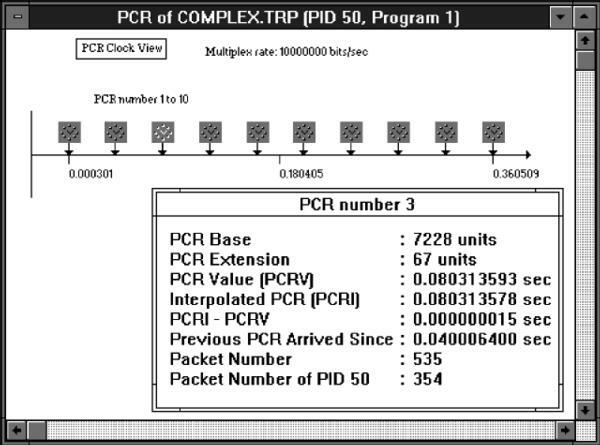 The Packet Jitter application accomplishes this by modulating the PCR data away from the correct values. The modulation can take the form of a sine wave, square wave, step, or random variations. Define the period and amplitude of the jitter to meet your own requirements. 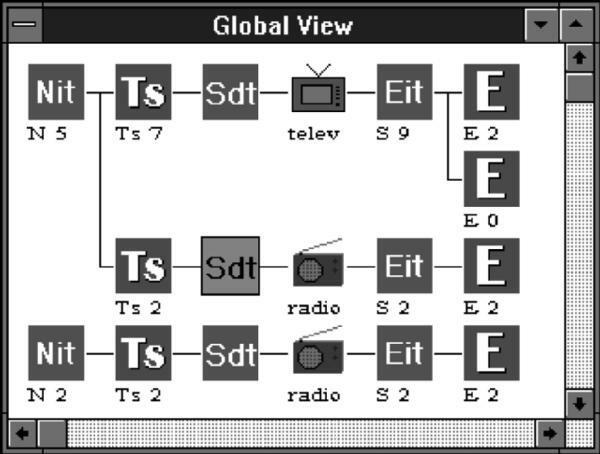 Transport streams created with this application allow for real-time tests of the decoder. The receiver PLL is stressed as it tries to filter out these variations to produce a stable reference clock. The Data Store Manager application controls the real-time generation and acquisition of the transport streams. It determines which of the ports are active at any given time and all the variables (bit rate, control signals, and clocks). This application also manages file storage on the Data Store Disks. It performs general housekeeping functions such as moving files, deleting files, and managing the disk space on the Data Store Disks. Required Receiver Termination - 100 ohm line-to-line.